The Karachi Union of Journalists-Dastoor (KUJ-D) has warned the federal government of large-scale protests if the culprits involved in the attack on senior journalist and The News International staffer Ahmad Noorani were not arrested within three days. At a protest demonstration outside the Karachi Press Club (KPC) on Monday, the KUJ-D and representatives of other associations also demanded the government of buying life insurance for the working journalists so in case of any injury or death while on duty, their families could get financial compensation and live an honourable life. “Enough is enough. We will not tolerate violence against journalists anymore and if the culprits behind the attack on Ahmad Noorani are not arrested within the next three years, we would be compelled to carry out protests across the country,” KUJ-Dastoor President Afzal Mohsin said while addressing the protest demonstration outside the local press club. 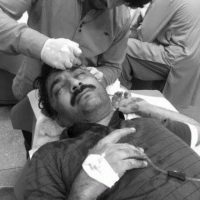 The News International staffer Ahmad Noorani was intercepted and attacked by six men on Friday when he was on the way in Islamabad. The journalist was beaten with iron rods while he and his driver were also stabbed by the attackers multiple times. A large number of journalists from different organisations and journalistic associations attended the protest, raised their cameras in the air in protest and also chanted slogans against violence against their colleagues. Carrying banners and placards inscribed with demands of ending violence against journalists, their forced disappearances, and attacks and killings at the hands of unknown perpetrators. The protesting journalists vowed that they would continue their struggle against corruption, authoritarian rule and efforts to undermine the journalistic norms and values in the country. Pakistan Federal Union of Journalists (PFUJ-D) Secretary General Sohail Afzal said had the government declassified the reports of the commissions which probed into deadly attack on senior journalist Hamid Mir and slain journalist Saleem Shahzad, the attacks on the journalistic fraternity would have been stopped by now. “We demand of the federal government to immediately declassify the Hamid Mir and Saleem Shahzad reports so that we would know the identities of the culprits behind the attacks and killings of journalists,” Sohail Afzal added. Senior journalist Mazhar Abbass said Ahmad Noorani was attacked because of his investigative stories, which showed that the authorities, institutions and government were not willing to tolerate the truth.